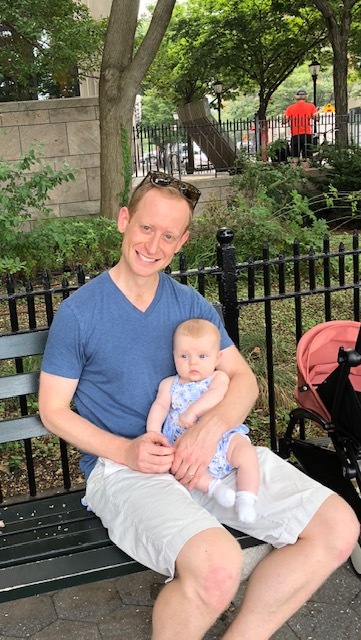 I am officially on paternity leave for all of August and September helping my daughter Maeve (born May 28) learn and grow and just spending time with her! First off, a huge round of applause to Pandora and other companies with humane and generous parental leave policies! Here is what the first week and a half has actually been like: I spend about a third of my time trying to get a tiny, sleepy human to go to sleep. About a third of my time changing, feeding, bathing, and playing with her. And about a third of the day, mostly while she is asleep, I get to read, watch TV, and listen to music and podcasts. Reading about Artificial Intelligence. I quickly read the book Bold (meh) but that was where I first learned about the Dartmouth Workshop. The workshop occurred in the summer of 1956 when a dozen pioneers of artificial intelligence met to define the field. One of the participants was Dr. Claude Shannon and I am just finishing up A Mind At Play: How Claude Shannon Invented The Information Age, I intend to read Marvin Minsky’s book Society of Mind (he was another participant). I spent a lot of time with The State of AI (nice work Ian!). Caroline and I loved watching Westworld and thinking about ethics around humans and machines. I am currently giving Maeve a TON of training data and I’m excited to read a lot more about the founding of the field and the current trends and latest advances. Watching The Vietnam War. Caroline and I watched The Post a few weeks ago. Since I like to learn about things in batches, Maeve and I are working our way through Ken Burns’ Vietnam War 10-part documentary on Netflix. I have read Legacy of Ashes and knew about all the covert work being done in Saigon before the US was officially involved but the series makes me want to read a lot more about LBJ. It is a story for a different post but many years ago I got to meet and speak with Donald Graham and hear Neil Sheehan tell the story of The Pentagon Papers at the Vietnam Memorial in DC. Watching the documentary and The Post is really rounding out my knowledge of the era. 1. Find an area of the world that you are instinctively excited and curious about. Even better if it is a unique intersection of interests that you and your team share. Music analytics was not something people were asking about or searching for several years ago, we were creating a new market. Each day at Next Big Sound, rather than getting more routine, it gets more interesting as we go down the rabbit hole gathering more data, signing on more customers, understanding their questions better, and providing answers which lead to more questions. This is only possible because of our innate curiosity and excitement about finding the Truth in this arena. 2. Start talking with as many other people as you possibly can about your idea and the part of the world you are most interested in. You never know who has a cousin/friend/classmate who shares a similar fascination and you want to expose yourself to as much serendipity as humanly possible. The famous saying is “it’s not what you know, it’s who you know.” I don’t think that’s entirely right. I think it’s more about who knows you. If you are the guy or gal always talking about bitcoin 10 years before it’s all over Techcrunch or the person obsessed with photography 5 years before Instagram’s sale makes headlines, opportunities will find you. 3. Once you’ve found the sector and others who share your enthusiasm it is time to run as fast as you possibly can. This means real validated learning with customers and users. In the early days don’t be too obsessed with A/B testing (since you have no users this will take weeks to run and provide questionable data) – build product, put it in front of people, get their feedback, rinse and repeat. At Next Big Sound we are 25 people and still trying to speed these cycles up no matter the cost. We moved the entire company from Boulder to New York City to be able to put new product in front of end customers in the music industry in half the time from when we were in Boulder. These cycles can never be fast enough. Caroline and I got married at The Diamond Horseshoe in New York City on Saturday August 12th and had an AWESOME celebration with our close friends and family (and an excellent band!). Monday morning we were off for a two week honeymoon in Africa: we saw Victoria Falls by helicopter, walking, and bungee jumping, spent several nights in Kruger National Park, a night in wine country and then rounded out the trip with a stay in the beautiful city of Cape Town. The wedding and trip of a lifetime! It’s a lot more exciting to read about a lottery winner than a story about thousands of people who spent $20 on losing tickets that really should have used that money for groceries. Or as Kristof says even more eloquently in a recent column: journalists have a bias toward sensational news. "We cover planes that crash, not planes that take off." Like everyone else starting a company I knew the road would be tough and that failure was nearly inevitable. Yet, we planned our launch to be a big surprise reveal. We planned to be able to technically support thousands of concurrent users. And we expected the press coverage we’d seen when seemingly every other company launched. I attribute these expectations to my warped understanding of entrepreneurship due largely to what I'd seen in the media. The founder that flushes her 401k and racks up hundreds of thousands of dollars in credit card debt. The founder whose spouse leaves them after decades of marriage when the startup takes over their former lover’s life. HORRIBLE board member investor behavior that almost never comes out. The thousands of startups that launched last year but never closed any investor money. The zombie years where growth in employees, revenue, or usage is flat or declining. I understand that no one wants to go on record talking about these scenarios but one on one over coffee or beers I’ve heard stories like these time and time again. I think it is a big disservice to the startup community that they aren’t talked about more publicly so entrepreneurs can start with better information than The Social Network as their blueprint for entrepreneurship. That would be like chefs using The French Laundry as their model for what it’s like to start a restaurant or Adele as a prototype for a singer. I just submitted the final grades for the 24 grad students of Data Analysis in the Music Industry: Strategy and Application MPAMB-GE.2211. With that, and a quick shave of my beard, my first semester as an adjunct professor comes to a close! Basic proficiency in collecting, cleaning, and conducting data analysis. An understanding of how data is currently being used (or could be used) across the music industry to make smarter business decisions. The first half of the course was heavy on data problem sets, APIs, building algorithms, and technical speakers and lessons. The second half of the course was much more about guest speakers from across the industry and how they use, misuse, or don’t use data in their role. I used two texts in the course to support these objective: Data Science for Business: Foster Provost and Tom Fawcett and The Signal and the Noise by Nate Silver. Each class would have a title (Class II was Messy, Messy Data), a series of questions for the class, takeaway points I wanted the class to walk away with, and homework that supported the lesson. There were six homework assignments, three quizzes, and a large take home group research final and presentation. My weekends were spent grading homework and quizzes and preparing for the 2 hour Monday evening class. Glad to be on summer break and back to just my full time job at Pandora! We had speakers from Sony ATV, Warner/Atlantic, Ticketmaster, Paradigm, Edison Research, Youtube, Instagram, Crush and mTheory, Buzz Angle and many more. The class also took a fun field trip at the end of the semester to Pandora’s NYC offices across from Grand Central and was definitely a highlight. Thanks to all the speakers that came and gave generously of their time and knowledge. One final thank you to the Pandora leadership team for allowing me to take this on -- we are all excited to see what the students go on to achieve throughout the music industry this summer and after graduation! I hate the feeling of wondering where the year went. Twice in my life I resolved to record every day in an app on my phone. I did this in 2011 and 2015 and it is the single best antidote to this feeling. At the end of a week or month, if you ever find yourself wondering where the time went, you just pop open the app and flip through the days and remember each in vivid detail and realize how much has gotten accomplished in the last stretch of time. That feeling of “I-can’t-believe-it’s-already-December” instantly disappears. I first did this in 2011 when we raised a $6.5M Series A for Next Big Sound. I also decided to do it in 2015, the year we sold Next Big Sound to Pandora. Both were very stressful and transformative years in my life. I love that I can go back and see how I was feeling, what I was doing, where I was on the planet, and what I was excited, hopeful, and worried about as each event unfolded. It sounds like an easy task to write down 3-5 sentences that describe your day each night but I’m actually looking forward to not having this resolution currently running and I don’t know if I’ll ever do it for a third time. In 2011 we had built the Next Big Sound team to 9 people, 2 of 3 major labels signed to annual deals, a partnership with Billboard to license two of our charts and a quickly growing name in the music tech world. That’s when I got a call from a large entertainment company in Los Angeles who was “on the 80 yard line with a competitor of Next Big Sound” but wanted to explore what an acquisition of NBS might look like. Leaning heavily on the counsel of Jason Mendelson I flew to LA the next day for a one-day trip of solid meetings with their executives and corporate development team. Jason suggested that in parallel David, Samir and I should discuss what our number is. The number with which we would be excited to sell Next Big Sound. If the offer was lower, we would refuse, if it was higher, we would accept. When acquisition interest started heating up in 2015 I refused to run such an exercise, but that’s a story for another day. The three of us went to dinner at the Boulder Chophouse. We ordered wine, nice steaks, plenty of appetizers, and talked about our business, our lives, our NBS ownership percentages, and what our “number” would be. What a surreal exercise! It really forces you to think through what you actually want in life and what’s most important to you. We were 24 at the time and had raised $860k. An NBS sale of $XXM+ would make us all multi-millionaires and we could take some time off and quickly jump into our next venture. Less than that would be awesome but we really didn’t want to sell the company as we were just getting started and finally gaining real momentum that had been elusive for so long.